In case you hadn’t noticed, our starting pitching landscape has changed. There are a pretty solid top 30 starting pitchers, and after that, everyone has some real question marks. Nowadays it’s hard to find a 200 innings starter outside of the aces, making ratios and strikeouts per inning even more valuable since you’re not getting as much volume. As always, these Dudes are mid-to-late round picks who have profit potential based on their respective ADP. I’ve got five Dudes for you lined up here. In your FACE, Five Guys Burgers & Fries! Man, I want a milkshake. The regular season is less than two weeks away! Don’t worry, there’s still time to add that “one more league!” Leagues are still forming at Fantrax.com, so head on over and jump in one today. Considering how much attention Shane Bieber has gotten this spring, it’s vexing why he is still available in the middle rounds of every draft I’ve done so far. His Fantrax ADP puts him at SP24/ADP156 but in the currently drafting Battle of the Black Book league, he went at pick 124. Bear in mind that if you’re in on Bieber like me, you’ll probably want to target him a bit higher than his 156 ADP. I like Bieber for a multitude of reasons. While his K-BB% in the bigs wasn’t as legendary as it was in the minors, it was still brilliant at 19.6%. That mark was good for 18th among qualified starters, placing himself among the elite. While the 4.55 ERA wasn’t great for those who were starting him last season, his ERA indicators tell a tale of bad fortune. I bet you thought only Pirates told tales of fortune! Bieber suffered a .356 BABIP and 69.4% strand rate, leading FIP, xFIP, and SIERA all to estimate that he should have performed a full run of ERA better. Some of the BABIP was deserved, however. He allowed a 43.9% hard contact rate because he pitches in the zone a little too much. While that approach keeps his walk rate very low, it also leads to more pitches that can (and did) get crushed. If you play in a league that counts Wins – and most still do – Bieber should amass plenty. The Indians are set to beat up on an awful division, getting plenty of turns against the White Sox, Royals, and Tigers ugly lineups. I’m all over Indians starters this year for that reason. 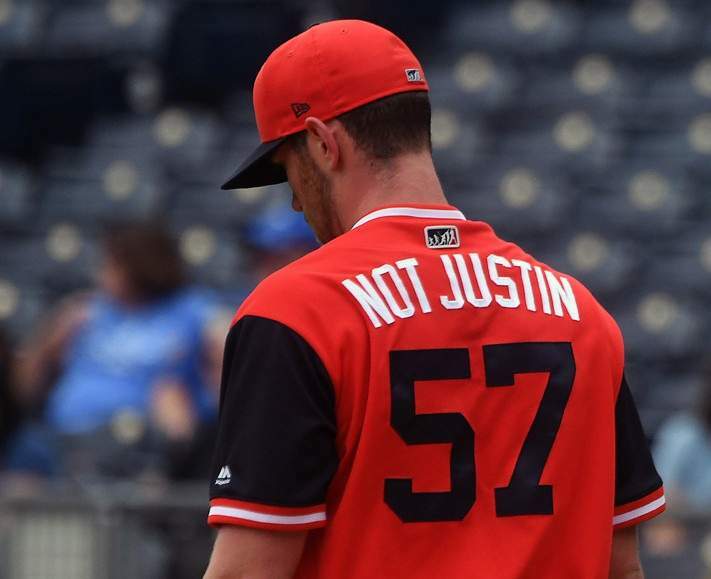 Most projection systems don’t think Bieber will surpass 140 innings, but if he avoids injury I believe he can push 200. Bieber’s mediocre fastball limits his overall upside a bit. However, if he throws more sliders and curveballs in 2019, he could take a big step forward and be a fantasy #2. Nick Pivetta is sort of the Shane Bieber of the Phillies. As with Bieber, he was saddled with some rough BABIP fortunes last year and was pounded for a 4.77 ERA over 164 innings. Again, as with Bieber, his ERA indicators all have him around a run lower than his results. Pivetta also featured a sterling 19.7% K-BB%. His arsenal and team context are quite a bit different than Bieber, however. Pivetta improved his control from 2017 and worked on his curveball as well. It became a huge weapon for him, and his swinging strike rate surged from 8.7% to 12% as a result. The Phillies have improved their defense somewhat, so Pivetta’s BABIP fortunes should improve. However, he has always been homer-prone, and that is a trend that could well continue. If his career 17% HR/FB rate continues, he will still be better than he was in 2018. If his HR/FB rate is closer to the league average 13.1%, he could pitch like a #2 and be a nice profit from SP44/ADP159. I wrote more in-depth about Kenta Maeda and the perils of being Dodgered here. To sum up my thoughts – Maeda has a ton of upside from his meager SP65/ADP234 sticker price. The big knock is still the injury concerns and the risk that comes with drafting any Dodgers player. They’ve yanked him back and forth from the rotation to the bullpen and back, a trend which you can’t rule out continuing. That could limit his innings, but the innings you do get from him are quite good. In 2018, his stuff took a step forward. He jacked his strikeout rate to 10.99 K/9, ranking him 13th among starters (min. 120 IP). His 3.81 ERA was ok, but his ERA indicators (are we sensing a trend here?) all point towards a 3.22-3.42 ERA. He tweaked his mechanics and improved his changeup, a pitch that earned a disgusting 27% swinging strike rate. Even if he only gives you 140 innings, this ADP will be a major bargain. If he puts up 175 as he did in his 2016 debut, he’ll be gold. Tyler Skaggs was enjoying himself a real nice 2018 until some injuries and blow-ups completely obliterated his second half. After 98 first-half innings of a 2.57 ERA, he got pounded for a 9.22 ERA over just 27.1 second-half innings. Injuries have always been the Achilles heel for Skaggs. Even this spring training he is dealing with some forearm soreness. As of this writing, it doesn’t sound like a big deal, but keep an eye on it as we inch closer to Opening Day. His 91 MPH fastball from the left side was great for him last year, and his changeup took a step forward as well. With the changeup being a plus pitch for him, he can further improve platoon splits against righties. His swinging strike rate jumped up to 11% in 2018, and he should hover around a strikeout per inning if that holds (and it should). He has good control, a good defense behind him, and a strong offense to help provide wins. As just the 71st starter off the board with an ADP of 247, all Skaggs has to do is stay healthy to make that ADP look silly by the end of the year. The 27-year old left-hander Caleb Smith was looking like the rare bright spot for the Marlins in 2018. He tossed 77.1 innings with a 4.19 ERA, 10.24 K/9, and 3.84 BB/9. Smith has always had iffy control, and while his walk rate was far from spectacular in 2018, it was a step in the right direction. Smith showed off a 2,365 RPM fastball with a changeup and wipeout slider which fueled the 11.6% swinging strike rate. His stuff was so good that his zone contact rate (which encapsulates the ability to miss bats within the strike zone) was 10th best in baseball (min. 70 IP). The nine starters above him? How about Sale, Scherzer, Verlander, DeGrom, Cole, Snell, Castillo, Flaherty, and Nola. Not bad company to keep. Sadly it all came to a sudden stop when Smith needed surgery for a severe lat strain in June. It’s been a long road to get back to the mound for him, and the Fish have eased him into camp to avoid any setbacks. In his debut, he tossed four perfect innings with six strikeouts, his velocity right back to where it was before the lat strain. There’s still a question whether Smith breaks camp with the team just because he’s been brought along slowly, but if he continues to dazzle there’s little doubt in my mind he’ll make the Opening Day roster. He’s never had much in the way of a workload, so you shouldn’t expect 180 innings. Considering his dirt cheap SP120/ADP413 price tag, however, there’s still a great deal of upside to be had. Are you down with Dokken’s Dudes and Don’ts? For more great rankings, strategy, and analysis check out the 2019 FantraxHQ Fantasy Baseball Draft Kit. We’ll be adding more content from now right up until Opening Day!